The Zimbabwean landscape is dominated by the reddish-brown color of the earth and the greens and yellows of the trees. As a gift to one nearby village, Monosov offered to paint a mud hut pink. 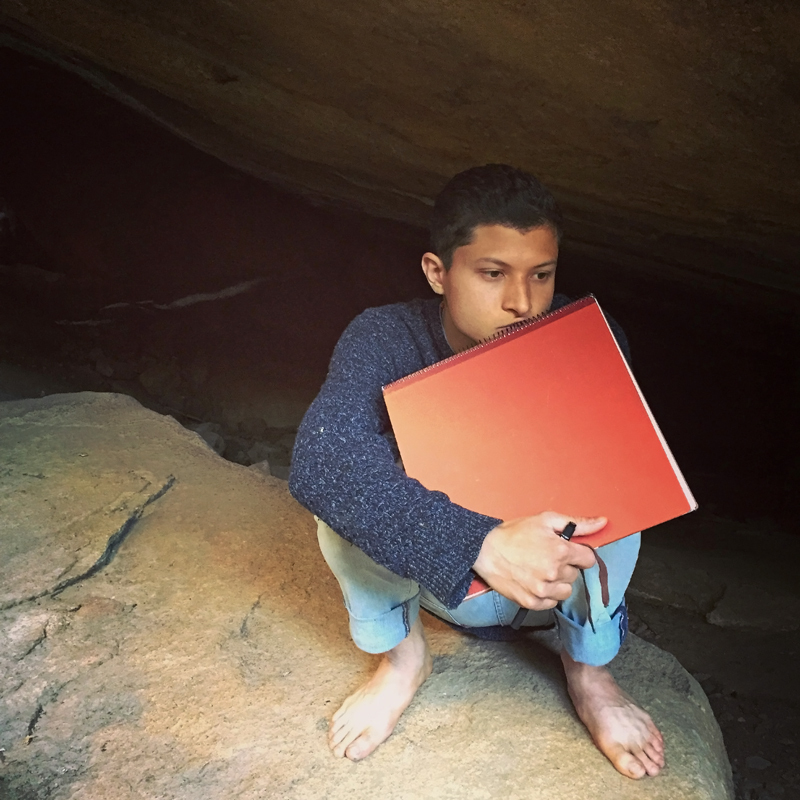 What happens when you give people not their survival necessities but a gift, which one artist desires to see manifested for formalistic reasons? The creative pursuit of bringing friction to the natural landscape ignites a dialogue regarding the aesthetic, political and cultural relationships between Africa and the West. 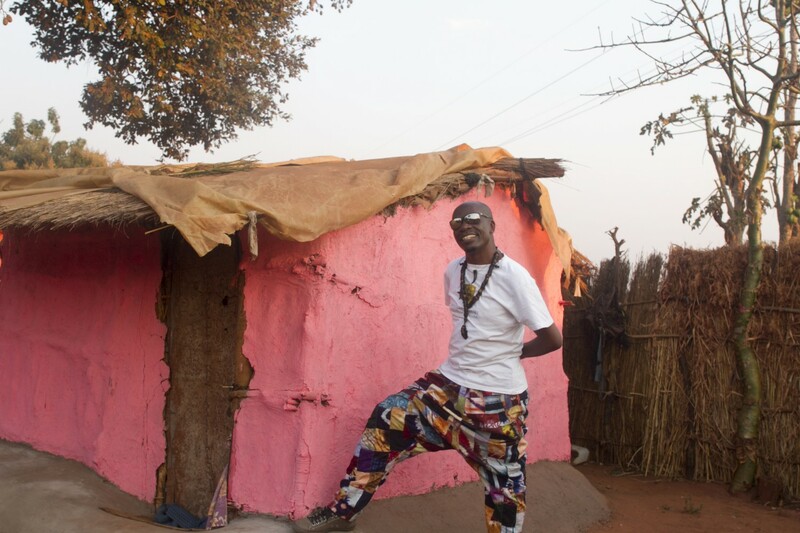 Pink Village is a video and photographic work that questions ideas of aid and assistance on the Continent. It is a documentation of a performance where Monosov acts the part of Westerner for the viewer and the villagers act their lives for her camera; all communicated through a veil of irony. Monosov and Kamudzengerere sit behind a table in an “office or stand” with a sign above their heads declaring LAND FOR SALE. 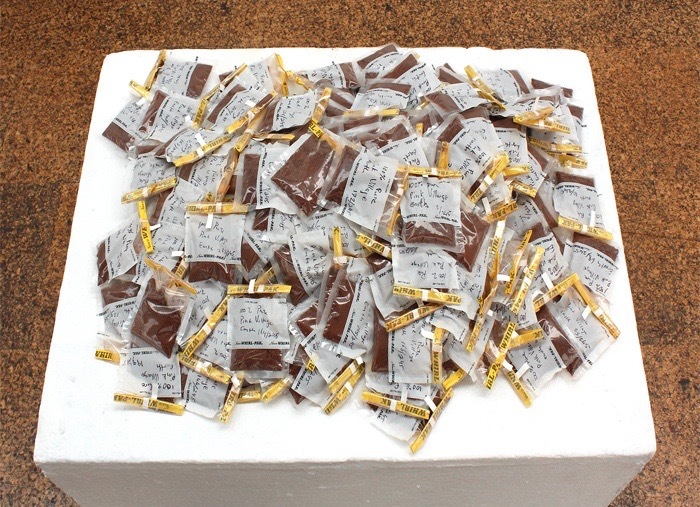 They are packaging earth which visitors can buy in small specimen bags reading: “100% pure Pink Village earth.” The artists invite visitors to learn about Pink Village, a place 25km outside of Harare, Zimbabwe whose mud huts were painted pink by a Western artist in 2015. Furthering the concept at the core of Pink Village, the performance Land for Sale is a critique of the contemporary commercialization of African resources and culture. 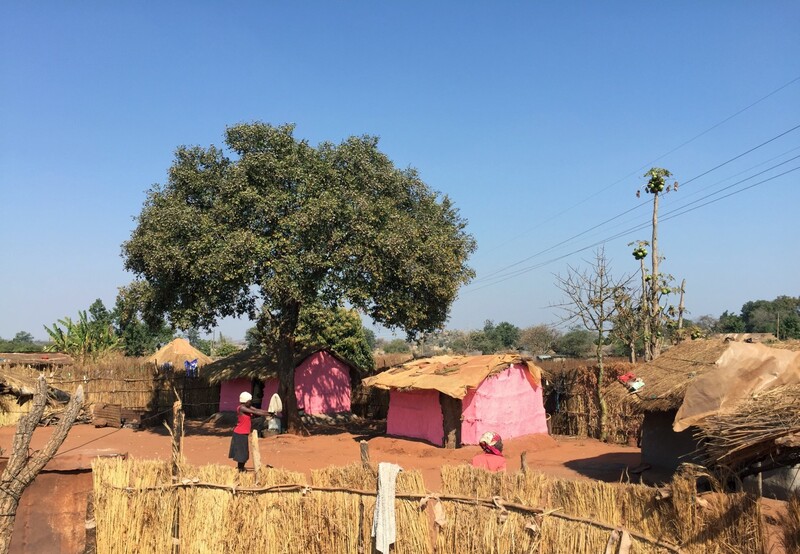 In the same breath, the money collected is actually shared with the village – blurring the lines between positive and negative. Steimer’s large paintings and series of paper works depict the spirit of this time and space. The materials used as canvases were already infused with geometry, history, local earth and energy. The marks on the large paintings were made while in the presence of Sokuru, the ancestral spirit brought to life by the local healer and medium Jonathan Dube aka Samaita. The works are testament to the part of the Residency that is often left unsaid, kept safe for those who experienced it. The paper works are portraits of spaces and time spent in Harare: the women’s kitchen who tirelessly cooked for 18 of us each night; a portrait of Musekiwa while he sculpts a sardonic stone head; the last hours of a goat’s life preparing for slaughter to accompany the ceremony that welcomed us foreigners into the intimate folds of the small Zimbabwean village; the “office” of a Shaman with its spirits flying around inside; a tourists’ lodge that offered “that sweet warm water” so rare in local neighborhoods; and our dear and invaluable host space Dzimbanhete where we were received and cared for like members of an extended family. It begins with what has now been coined the Paper Project. This is Admire Kamuzengrere’s brainchild and he hooks Justin Orvis Steimer into a collaboration. He starts with a roll of brown paper 1000 meter long. From the steps of Dzimbanhete, where I now sit and write, he starts unrolling and making marks on the paper with black paint. At first he paints with control, but as his brow starts to sweat and a few hundred meters of paper are behind him, his movements become instinctual, the paintbrush is now an extension of his body, no longer his mind. A few of us walk with him and set rocks on the paper to hold it down and protect it from the blowing wind. At the Boulton Atlantica Lodge, our home for the month, Justin, with his own helping team, begins unrolling paper. 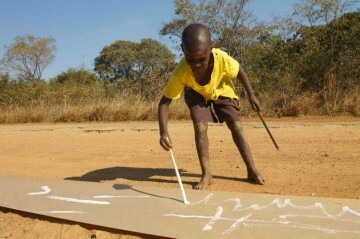 He makes white marks with his paintbrush and is quickly surrounded by the village children who he encourages paint with him. 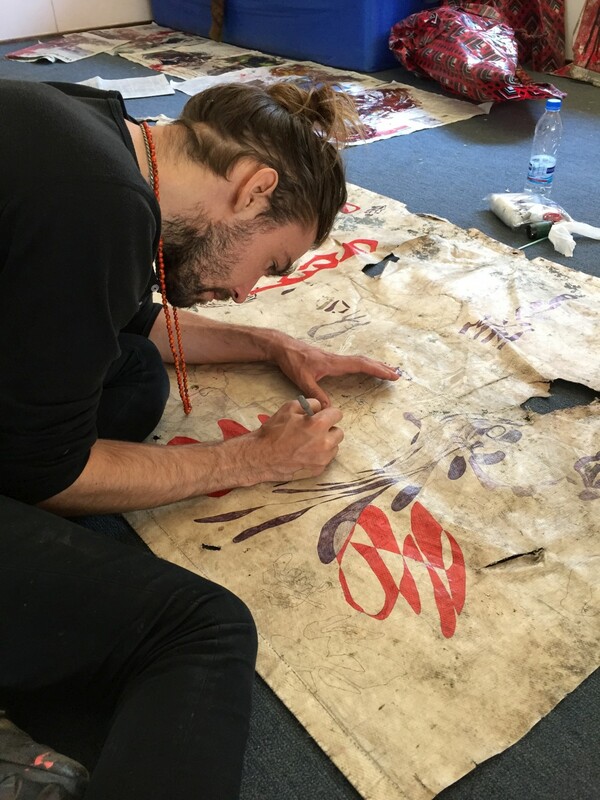 The creative freedom offered, and the now collective mission of covering distance with the simple act of rolling and painting paper, resulted in a sea of enthusiasm and gratitude. Not only did locals of all ages passing by engage spontaneously by adding their own marks to the paper, or helping with the labor involved, but we could all feel the bubbling of collective inspiration. Several sections of the paper have “this is the best day of my life,” written in Shona. The two artists met in the middle where their work and their cultures overlap. The symbolic nature of the project set the tone for the rest of the week. One Dzimbanhete artist and one visiting artist execute an idea whose results they do not know. The mutual motivation was enough for them to start and along the way they faced their challenges and found solutions together. From opposite ends they meet in the middle… in some ways it’s what this entire trip to Zimbabwe is about. An unexpected and interesting parallel appeared between two 25-year old artists, one Zimbabwean and the other Surinamese. Both grew up in post-colonial societies and were trained by their patriarchs at a very young age–Musekiwa in traditional stone sculpture and Robles de Medina in painting and drawing. Although they hail from opposite parts of the world, their experiences and career journeys share infinite similarities. Here, each explores the unique characters making up the social and political arms of Zimbabwean daily life. 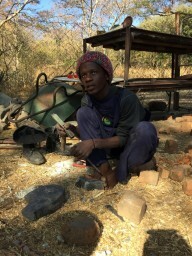 Robles de Medina deals with stories of physical collision between black and white Zimbabweans within the context of the widely controversial land reform act of 2008; and Musekiwa presents his unique and humorous vision of the world, mixed with a current interest in Chinese products that have inundated Zimbabwe over the past decade. Together, the two artists create a portrait of a people – to open fresh dialogue about religious change, the making of history, forgotten traditions of magic, and the quotidian turmoil that is still at the heart of most Africans living on the Continent today. What started in Zimbabwe as 18 people squeezing into three cars and driving to the neighbor’s farm to manhandle 30+ goats in the name of art is reimagined within the confines of the contemporary exhibition space. The lights go out for the performance. 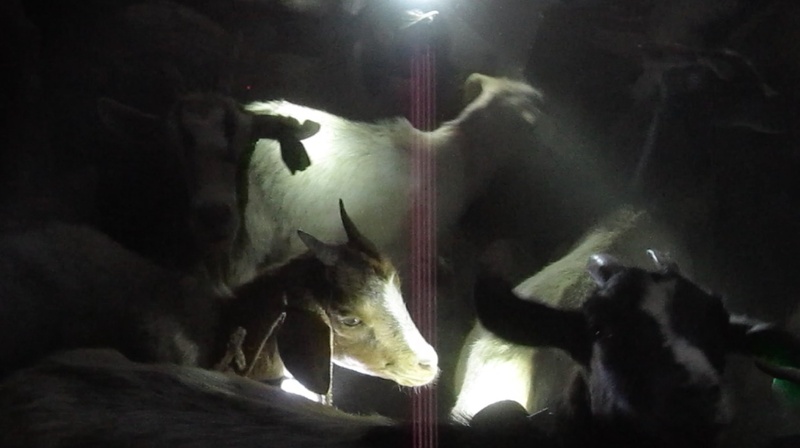 The sound of hoofs clopping is heard by the awaiting audience, and that smell of goats arrives first as eyes adjust to the darkness to see the herd enter the space. As performers start catching each animal to wrap headlamps around their horns, the room flickers with the erratic lights cast by the animals. As Gareth Nyandoro leads the illuminated procession around and eventually out, the audience is left to contemplate the place of animal versus art, of goat herder versus artist, and of the power of circumstances and location when making a statement. The inception of this idea came on a trip to the 2013 Venice Biennial. Having spent time living in Africa, Catinca found her way to the Zimbabwean Pavilion, a fifth floor walk-up on the way to the Giardini, and one of only a few African presentations. Inside, she found a drawing that both excited with its contemporary lines and evoked deep emotion with its subject matter: Virginia Chihota’s Mistakes In The Right Lines. Two years later, while in Venice working on a Justin Orvis Steimer exhibition, the Zimbabwean Pavilion surpassed all expectations once again with Gareth Nyandoro’s giant cut-paper works stealing the show. Catinca struck up a conversation with Raphael Chikukwa, the Pavilion’s organizer and one of Africa’s star curators, and expressed her growing interest in building a collaboration with the burgeoning art scene in Zimbabwe. That exchange landed the newly formed CTG Collective in Harare not two months later. With ideas of collaboration, cultural exchange, and personal growth, what ensued from this voyage exceeded the most elaborate of expectations. Dzimbanhete sits 25 kilometers outside the center of Harare. Here, artists are given the freedom and support to make work and engage in dialogue. It is also a place where one can commune with music, nature and its spirits. 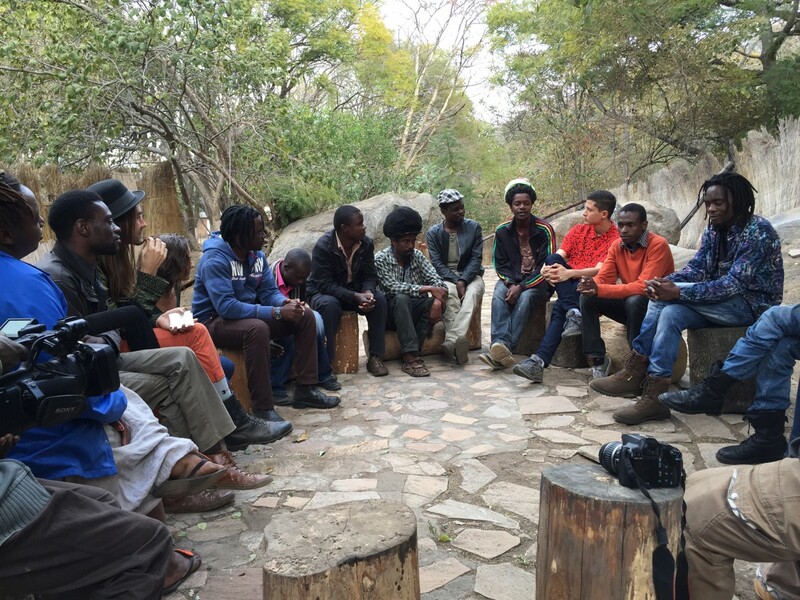 3 international artists hailing from New York, Surinam and Israel, joined 10 Zimbabwean artists to live and work together for one month. What happened crossed and re-crossed artistic, cultural and personal limitations. The project transcended boundaries between tradition and contemporariness, foreign and local, African and Western. CTG: Zimbabwe became a space where the traditions of our Zimbabwean ancestors were not only kept alive but propagated, and simultaneously, where artistic pursuit was relentlessly challenged and artists were pushed to evolve, playing their part to accompany Zimbabwe’s transition into a real player on the international contemporary art scene. Our expectation of walls and cultural collisions were preconceptions that quickly vanished. We are living the same experience in drastically different environments. In a space where we are foreigners to one another, our search for identity rises to the surface as a common pilgrimage.